Wagrain is near Mozart’s city of Salzburg and is, along with Flachau, St. Johann-Alpendorf, Zauchensee, Flachauwinkel, Kleinarl, Radstadt, Altenmarkt, Filzmoos and Eben, one of the Salzburg Sportwelt ski resorts. 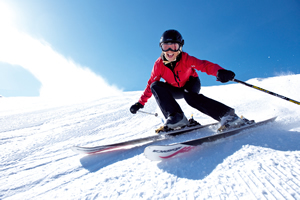 As well as fabulous ski slopes and modern ski lifts, this top region also has many other sports facilities. Whether for beginners or more advanced skiers and winter sports lovers, for a family holiday, a day trip, or a short trip with friends.... you will find just the right thing in and around Wagrain. Wagrain’s ski area offers you quick, convenient access to skiing. High capacity cable cars take you to the very top of both Grießenkareck and Grafenberg in one go with no stops. Wagrain is part of the 3-valley interconnected ski area Flachau – Wagrain – St. Johann-Alpendorf. With Wagrain as your starting point, you are directly linked to the pistes in Flachau and St. Johann-Alpendorf. The two mountains Grießenkareck and Grafenberg are on either side of Wagrain in the very heart of the Salzburg mountains. The Salzburger Sportwelt itself contains 5 top ski areas, 25 ski resorts, 270 lifts and 760 kilometres of well prepared ski pistes. With just one ski pass you can ski in the whole of the Salzburg Sportwelt, the Schladming-Dachstein area, the Grossarl valley, Gastein and the Hochkönig region.